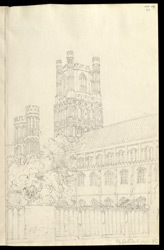 This drawing shows the west tower of Ely Cathedral. Construction of the main body of the church began in 1081 and continued for over a century. Upon completion of the nave, the tower was added in two stages. The first two-thirds of the 215 ft structure was built at the end of the 12th century, the final third in the late 14th century. The church, which formed part of the Benedictine monastery at Ely, was granted cathedral status when, in 1109, the Diocese of Ely broke away from the Diocese of Lincoln. It is testament to Ely's ecclesiastical importance in medieval England, and to the breathtaking quality of its architecture, that when Henry VIII shut down the monasteries in 1539, the cathedral suffered sufficiently less damage than other cathedrals of similar size and status.